Digital baby and toddler scales are a great way to keep tabs on your child's growth, especially for regulating breast feeding (Source). Our top pick, the Salter Baby and Toddler scale, has a 45 pound weight capacity that is measured in .5 oz. increments. It converts from a baby scale to a toddler scale by removal of the curved toddler tray. It also features a handy zero function that will help you to subtract the weight of clothing or diapers to make sure that you get the most accurate measurement of your baby or toddler. One pediatrician writes that this particular scale in his 32 years of experience is one of the most accurate and sensitive scales that he has ever worked with. This LCD Health o meter 2-in-1 digital baby scale is a unique kind of scale for measuring babies that you can convert from a tray into a platform for toddlers. It also comes with a growth chart which can help you track the height and weight of your child, and compare it with national averages. For many users it is cost effective as well as accurate, making it the best choice for many parents. Keep in mind that the 9v battery required for the functioning of this device is not included. 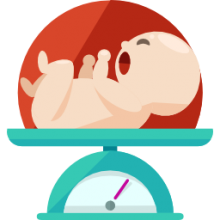 The Baby to Toddler Scale Health o Meter is a good device to have around the house for measuring and monitoring the weight of your children, and ensuring their health. Users of the Health o Meter Toddler Scale say that accuracy is perhaps the best feature of this product. For one user of the Grow with Me 2-in-1 Scale the ‘zero out’ feature helped when measuring the baby because there is no need of weighing the diapers, clothes, blanket etc separately. Another user of the 2-in-1 Baby Health o meter shared her experience that it was very easy to use, and was comfortable for her child as well when she weighed him. A minority of users of the Health o meter Toddler Scale have complained about the machine not working after 3 months. This Homeimage Digital Scale for infants also has a music function. It is ideal for keeping track of your baby’s weight, or even your pet’s. It has a curved design which is quite comfortable for both the baby as well as for your cat or (smallish) dog. The design also makes the scale pretty easy to use. Users like the number of features it has including the tare option as well as the hold feature, both of them which make weighing the baby or the pet easy. Keep note it doesn’t work accurately on carpets. The Homeimage Infants and Pets Scale is a good option to go for if you want something that is affordable and durable. The general user consensus regarding the Infants and Pets Digital Scale is positive. One user of the Homeimage Digital scale said that it was as accurate as the scales appear in many local health clinics, which is a definite endorsement. Another user of the Digital Scale for Pets and Infants liked the sleek design, and shared his experience that his pets liked to lie on the machine for no reason. However, a minority of the Pets and Infants Homeimage scale complained you have to keep resetting it in order to change the scale from kilograms to pounds or ounces and vice versa. 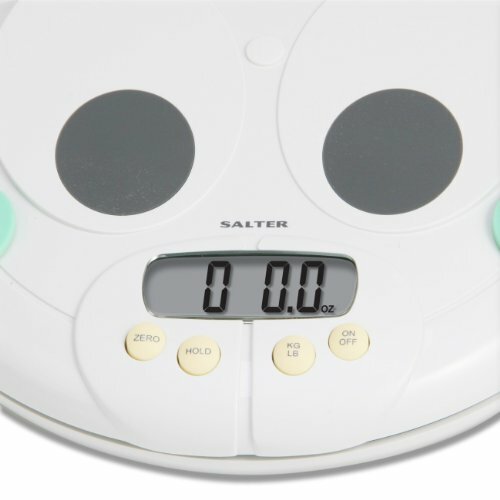 This Salter Electronic Baby Scale has a capacity of 45 pounds. It is designed as a baby to toddler scale. This means that the baby scale can easily be converted into a scale for toddlers by simply getting rid of the tray. Users liked that the tray was smooth in design and comfortable for the baby. Keep in mind that the tray can be a bit short for some toddlers. It comes with two specific functions: a hold function and a zero function. With the hold function, you can get to see the weight of your child even if they move around. The zero function takes out the weight of the clothing or the diaper so that the scale can provide a measurement that is more accurate. The Electronic Salter Toddler Scale is good investment for keeping a record of your baby’s weight. Users of the Salter scale found that the zero function to be quite useful because they could easily determine the weight of the baby before nursing and after nursing. Users of the Electronic Salter scale loved that the scale measured in ½ oz. increments. However, one user of the Baby to Toddler Scale did complain that the increments should have been in 1/4 ounce increments. A minority of the Salter Scale users also found the machine to be inaccurate when they compared the results from toddler scale with the scales at their doctor’s clinic. The Beurer BY80 Scale comes with the hold functions that enable you to make precise measurements of your baby’s weight without waiting for the next doctor’s appointment. Users like it for its neat design and large easy-to-read display. Keep in mind that it doesn’t come with a carry bag. It also has an automatic switch-off button and has a weighing capacity of 40 pounds. 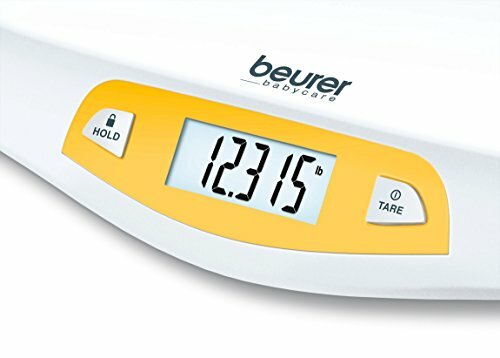 The Beurer BY80 Scale is an affordable item for measuring the weight of your baby to ensure his or her healthy growth. A majority of the users of the Beurer BY80 Baby Scale liked the accuracy of the machine. The Beurer BY80 uses increments of up to 0.18 oz., making the measurement highly accurate. Buyers of the BY80 Digital Scale also liked the tare option since they could cancel out the weight of the blanket that they put on the scale by using the tare option prior to measuring the weight of the baby. One user of the Beurer Baby Scale liked how easy it was to switch between the different units of measurements. However, a minority of the Beurer Baby Scale users did complain that they had difficulty in knowing the exact amount of milk that their kid took in when they used the machine. The HealthPro Digital Baby scale has a contoured pearl shaped design. It provides consistent and accurate measurement up to 0.3 to 0.4 ounce increments. Users like it for being comfortable for the baby as well as the pre-installed music. Keep in mind that it is not suitable for weighing small pets. It also comes with a measuring tape as well a growth chart in which you can mark the progress that your baby has made. It also has a washable pad to ensure that your baby lies in a clean and comfortable area while you weigh him or her. 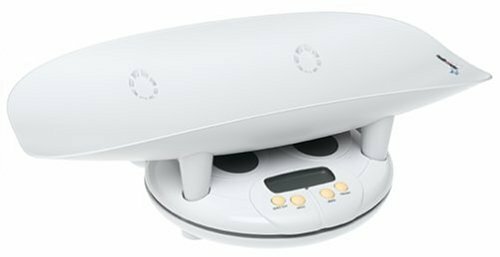 The HealthPro EBB-1 is the absolute perfect choice for parents that need to track the weight of their baby before and after they are fed. Users of the HealthPro Digital Baby Scale liked the blue LCD screen since it made reading the measurements much easier. One user of the ‘Watch-Me-Grow’ Digital Baby Scale loved the pearl-shaped design of the device and how it was able to cradle her baby. While there is a music feature, a minority of the users of this Soothing Music Digital Scale didn’t love the music. Some users of the EBB-1 Scale also complained that it was not suitable for measuring their small pets, and using the music feature while measuring pets ended up in scaring them away. If you are looking to keep tabs on your baby's weight while you are nursing, in between pediatric visits, or just to keep a general tab on how your child is growing, there are several inexpensive and highly accurate digital baby and toddler scales on the market today. They are great way to keep tabs, specifically, on breast-feeding progress-enabling you to specifically understand how much your baby is eating per feeding, which helps mothers to regulate their milk supply and the child's weight. Interestingly, some people use these little baby scales to weigh cats- so they actually have veterinary applications as well. If you're looking to purchase an electronic baby scale, make sure you read a lot of reviews, check out our comparison chart and our top recommendation the Salter digital baby and toddler scale.